What glorious grace has been extended towards each of us who are His children. He found us utterly destitute, dead in trespasses and sins, and without hope in the world. And God picked us up and…. then what? Did He brush us down and wag His finger at us? Did He threaten us:- not to ever do it again? No!! He showed us His grace and mercy, His forgiveness and love. 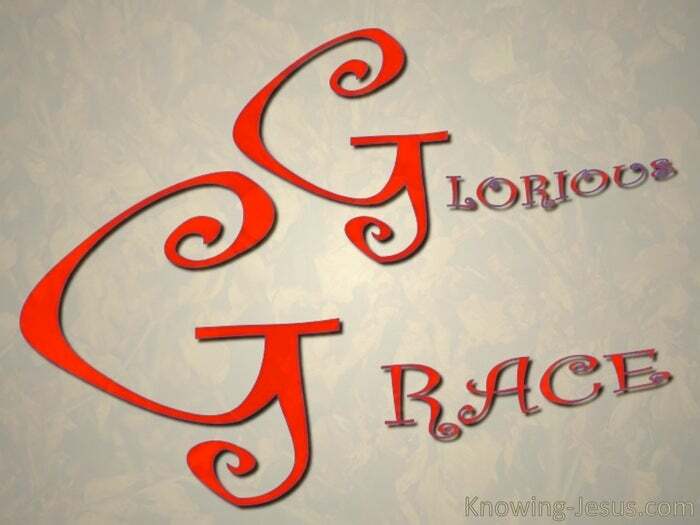 He poured in grace and more grace – and grace upon grace upon more grace. He picked us up, out of the miry clay, and set our feet upon the Rock. He clothed us in righteousness, and seated us in heavenly places in Christ… but what is so often the reaction of the forgiven sinner? Well.. We know the word ‘forgiven’ – but we find it difficult to apply it to ourselves. We know the words ‘grace‘ and ‘love’ – but can’t quite see how we qualify. We know that God has done this for us – and yet we cant quite accept it. But what is so astonishing is that the majority of Christens try to ‘pay God back’ by good works:- caring for the sick and orphans; preaching to the lost and widows. These may be ‘good works’ but they often cover a spirit that just can’t accept God’s grace. But such attempts to recompense God are eventually recognised as not acceptable. Why? – Why does God not accept such recompense, when done for the best reason? Why does God not accept our daily striving, which show our appreciation of Him? Well, this is the reason.. There is nothing whatsoever that can recompense God. It is finished. Completed by Christ on the cross and you are accepted in Him.. Period. So what is the secret of accepting God’s forgiveness, and His grace and His love? Well – it’s to trust Him. It is to willingly to consent to be loved – while being utterly unworthy. It Is really believing what the Bible says:- that you are accepted.. for Jesus told us that you can do nothing, absolutely nothing without Him.. because He has done it all. And God has accepted us, on His behalf. 2. To refuse to make ‘resolutions‘ and ‘vows‘ – for that is to trust in the flesh. 3. To expect to be blessed, though realising more and more your lack of worth. 4. To rely on God’s chastening (child training) as a mark of His kindness. 5. To ‘hope to be better’ (hence acceptable) is to fail to see yourself in Christ alone. 6. To be disappointed with yourself is to have believed in yourself! 7. To be discouraged is unbelief, as to God’s purpose and plan of blessing for you. 8. To be proud, is to be blind! For we have no standing before God, in ourselves. Newell sums it up this way… Lack of divine blessing, comes from unbelief. It does not come from a failure of devotions. To preach devotion first, and blessing second, is to reverse God’s order. To preach devotion first, is to preach law, not grace. The Law made man’s blessing depend on devotion. Grace confers undeserved, unconditional blessing. Our devotion may follow, but does not always do so in proper measure. What glorious grace has been extended towards each of us who are His children. He found us utterly destitute, dead in trespasses and sins and without hope in the world. He poured in grace and more grace and grace upon grace upon more grace. He picked us up out of the miry clay and set our feet upon the Rock. He clothed us in righteousness (the righteousness of Christ), and seated us in heavenly places in Him. Thank You Lord. Thank You. Thank You Lord for Your Glorious Grace.